"With its hidden waterline, the biOrb HALO 60­ is a visually seamless aquarium. You can enjoy all the technology of an advanced aquarium set up, supplied in one box. 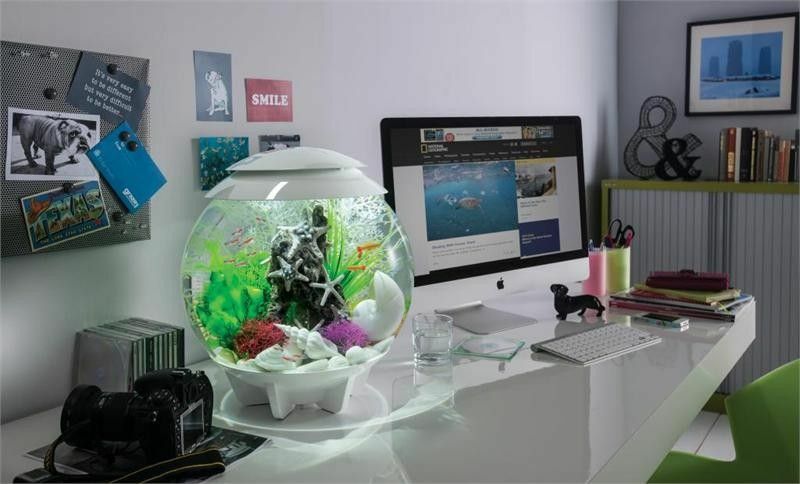 The biOrb HALO 60 is the perfect aquarium for anyone new to fish keeping." "Dimensions Height: 22 inches (56cm) Width: 19.6 inches (50cm) Weight (empty): Weight (full): 130 pounds (61 kg) Volume: 16 Gallon (60L) What's in the box? biOrb HALO 60 aquarium 900g of ceramic media Air stone Filter Cartridge 12v transformer Low voltage air pump Water conditioner and beneficial bacteria liquid Fish food Instructions Transformer 12v transformer Two connections (light and air pump) 12 month guarantee 12V Air Pump Quiet operation 1.5m air line with 1-way valve 1m power cable 12 month guarantee Electrical and environmental requirements Line voltage: 12V AC Frequency: 50Hz or 60Hz, single phase Maximum continuous power: 12V LED light including moonlight Low voltage 12V AC Power 50/60 Hz 3x daylight power LED's (supplied fitted) 1x Moonlight LED (supplied fitted) Low power consumption 12 month guarantee Safety Standards Complies with UL, ULC and CE safety requirements."